The Glo Oga SIM offers some of the most affordable data plans you can get at the moment. With this offer, you will get 125% percent bonus on all data purchase. This means, if you buy N500 worth of data plan, you will get 1.8GB instead of the standard 800MB, N1000 will give you 3.6GB instead of 1.6GB, N2000 will give you 8.26GB instead of 3.65GB and N2,500 will give you 12.9GB instead of 5.75GB. Buy and register a new Glo SIM from any Glo experience center or outlet. Get any old Glo SIM that you have never subscribed on before or any Glo SIM whose last data plan expired more than 90 days ago. Dial *777# and select the data plan you want to subscribe for. You will receive he regular data as well as the extra data in a different SMS. Q. What is Oga SIM? 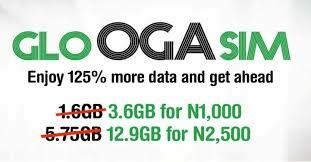 A. Oga SIM is a promo that offers new customers 125% data bonus on all plans. Q. Is the Oga SIM different from the current Glo SIMs? A. Any new Glo SIM is Oga SIM. Q. Are these new plans available to all customers? • Any customer who buys a new Glo SIM. • Existing customers who have never used data on their SIM before. • Customers whose last data plan expired more than 90 days ago. Q. Can I auto renew with a lower plan and still get the extra bonus data benefit? A. Yes. As you auto renew to a new plan you will you get the extra bonus data for the plan bought. Q. Can these plans be gifted? A. Yes. All data plans are giftable. But the bonus received will depend on the status of the giftee and not the gifter. If the giftee is a new customer (or new/returning data customer), he will get 125%. If the giftee is an existing or old customer, he/she gets 25% bonus. Q. How do I get these new plans? A. These Plans are available via *777# for plan menu and selection on http://hsi.glo.com . Q. Will these plans work on modems, routers and mobile routers? A. Yes, these plans will work on any compatible internet enabled device. Q. Can I subscribe multiple times? A. Yes, these plans will work like any HSI plan and share all the HSI features. Q. Are these plans auto-renewable? A. Yes. A Data Plan is considered Auto Renewed if you buy another Data Plan before the expiry of the existing data plan or within 7 days of expiry. Q. Will I get 125% bonus if I am using a 4G SIM on a 3G device? A. Yes, the promo is targeted at all new customers irrespective of SIM type (LTE or 3G) and irrespective of the device. Q. What is the cost of the Oga SIM? A. The Oga SIM is your regular LTE SIM and is priced the same at N150 per SIM. If you have any question to ask, feel free to drop it in the comment section below and also don't forget to kindly share this post on your various social media platforms if you find it helpful.